They created the most touching awesome thing I’ve ever seen. We featured The Society of Design (SOD) on Day 30 where we highlighted the organization’s mission to “elevate and expand the discourse on design while providing inspiration.” SOD recently organized a clever pitch to get designer / illustrator Jessica Hische to come speak in her home state of Pennsylvania. Instead of simply sending their request in an email, SOD turned the proposal into a team effort. 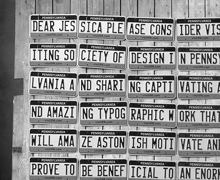 They invited designers who live in PA to participate in “something amazing.” The details were left intentionally vague and a little over three months later the results of the project were in: an invitation created from 27 custom vanity license plates, photographed, and released on a personalized site just for Jessica. The heartwarming gesture certainly touched our hearts. Jessica was moved to tears. After a joyful cry, she tweeted, “@society of design the answer of course is YES! I will marry you! I mean come to Pennsylvania.” She has a gift for SOD in return, personalized illustrations for each of the designers that participated in the project. The fun didn’t stop with Jessica. Armin Vit featured the invitation on Quipsologies and joked that when he was asked to speak all he got was an email. SOD replied in turn with a playful secret message for Armin. Cheers to SOD for spreading smiles across the internet and reminding us that sometimes design is just about having fun and creating gifts that move the design community. Whether your goal is to delight potential customers, funders, or guest lecturers—design details make the difference. Not only did the Society of Design present Jessica with an experience she’ll never forget, they created something worth sharing. Design is about relationships and we want to be friends with the Society of Design. Read more about the story behind the project here and if you’re heading to the “Keystone State” in the coming months check out SOD’s upcoming events.